A story of intrigue, mystery, romance and the paranormal, surrounds a young widow who struggles with falling in love with the man who kidnapped her and the love she left behind. 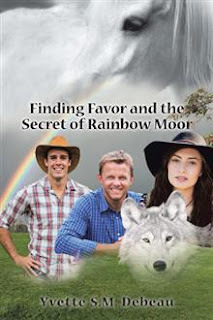 Favor Durand left the hectic, bustling City of Angels and moved back to her home town of Fortuna, nestled in the heart of the Redwoods of Northern California. The town she grew up in, is known for its peaceful, warm, friendly atmosphere and charm. Her busy career would continue to take her back to the lively metropolis of the city but the quiet peaceful surroundings of Fortuna, is a stark contrast from that of the metropolitan rat race. Here she has made new friends, and reconnected with old. With the slower paced life comes inner peace she has longed for. But then a strange series of events turns the life of this young Interior Designer into chaotic uncertainty. Yvette S.M. Debeau's passion for writing started at a young age by winning numerous awards in writing contests. Formerly the Newsletter Editor, Publisher and Writer for the Redwood Unit of the Back Country Horseman of California, in which she was the recipient of 9 consecutive Journalism awards. Former Planetarium Sky Studies Instructor, Writer and Producer of Planetarium shows for College of the Redwoods. An avid horse lover and owner of three Arabian horses. Yvette is giving away a $25 Gift Card!